The school superintendent really did this country a disservice with this one. 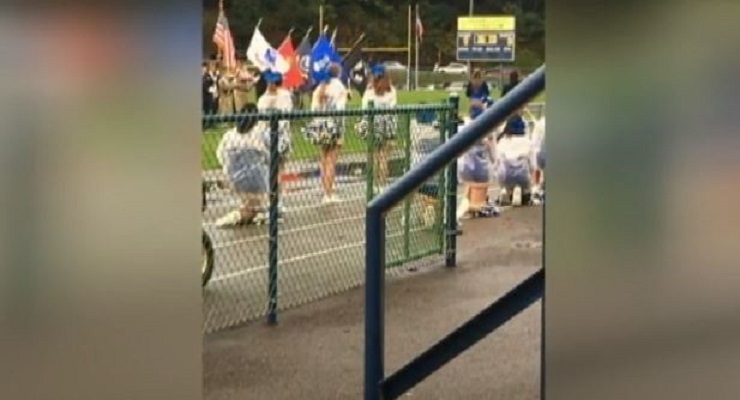 Believe it or not, the VFW color guard and WW2 veterans were invited to a high school football game… while there, they witnessed the biggest slap in the face. The little twerp students, no older than their great grandchildren, decided to be little socialists and take knees as the National Anthem played. These kids need to meet with these veterans in person to apologize for being ignorant of what REAL oppression is. These military vets at the Pennsylvania high school football game were offended that several of the cheerleaders took a knee at an idiotic protest during the National Anthem performed by a Veterans of Foreign Wars Color Guard. Now, if only that reverence for the rights were applied to all the others, like the 2nd Amendment. Hypocrites. “They don’t know what they are doing” Danny Larocco, a WWII veteran who enlisted in the military right around the age of these cheerleaders, told Channel 11 News. This ‘protest’ follows after the ‘protest’ that Colin Kaepernick started and now kids who know nothing of the facts, follow suit as tools. Oh no! The poor child is being oppressed! Give me a break.